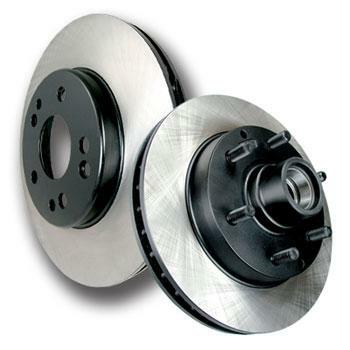 Centric Premium Rotors are blank, 1-piece, direct replacement discs for your factory brake system. These “black” rotors feature a special anti-corrosion e-coating that gives them their distinctive look and name, and are manufactured under QS and ISO quality system standards. StopTech Premium Rotors are particularly desirable in fleet or emergency vehicle applications when an upgrade to Power Slot or SportStop performance replacement rotors is not possible. Like many StopTech, Power Slot and SportStop rotors, Centric Premium Rotors offer several key advantages over stock rotors, E-coating, Double Disc Ground, Machined Finishes, Split Castings and Mill Balancing are just some of the processes we use. Centric premium rotors utilize an electrocoating finish that provides long lasting corrosion protection. E-coating is a superior electro-statically applied finish designed to withstand 400 hours of salt water exposure without rusting. Finishes used by other manufacturers provide only minimal protection from the elements and are generally only effective for the shipping and storage portion of a rotor’s life. The addition of heat and moisture eliminates the effectiveness of many of those finishes resulting in immediate corrosion once installed in the vehicle. Nearly all Centric premium rotors feature a double disc ground, taper free finish. Double disc grinding ensures parallelism, eliminates run out and provides near perfect disc thickness variation (DTV). Double disc grinding leaves a non-directional finish on the friction surface area for more effective pad-rotor break in. This special finish also provides quieter and smoother stops. Premium rotors feature 100 percent fully machined finishes including rotor hats. This extra process provides better rotor balance and creates a cleaner, more finished looking component. The profile of the rotor’s cooling vane affects its ability to dissipate heat. Ideally the vane should have the same thickness at the points where it connects to the inner and outer friction plates. This is accomplished with center-split core castings that provide proper heat transfer and thermal efficiency. This thickness symmetry in the vane promotes the uniform transfer of heat from both friction plates into the cooling vanes. Competitors’ vanes are often asymmetrical, which can lead to uneven heat transfer and compromises in performance and cooling.